Plywood Between Mattress and Boxspring – Good or Bad Idea? We would like to firm up our mattress can you tell us how you feel about a piece of Plywood Between Mattress and Boxspring – Good or Bad Idea? Answer: Not only will we answer that question but a few other commonly asked questions along the same lines. Does putting plywood between the mattress and boxspring increase support? Putting a piece of plywood on a flexible energy absorbing boxspring will not allow the boxspring to give where the body needs it to give. Does positioning a piece of plywood in between the boxspring and mattress increase mattress life? No, especially in the case of flexible boxsprings that can absorb energy that is designed to provide give. If the boxspring does not have the correct give to it the mattress can become squashed and compressed between our body weight and the piece of non giving non-flexible plywood. In the case where the mattress was originally designed for use with a flexible boxspring, use of plywood under the mattress will accelerate wear. Do doctors / physicians recommend placing a piece of plywood between your mattress and box spring? Back in the day this was a common practice for physicians. They believed that placing a board between your mattress and boxspring increased the support for our bodies. At that time the reality was that practice did two things. It increased the speed at which the mattress would wear out while offering some additional temporary firmness for what was usually a worn out mattress. Today my guess is most doctors wouldn’t have a clue as to what impact a piece of plywood would do when used in conjunction with a mattress set. If the doctor did their research they would find that many boxsprings are not boxsprings at all, but are actually foundations that are already rigid just like plywood which of course doesn’t give. Other boxsprings are considered semi flexible, but are just about as rigid as the foundations I just mentioned. What is the advantage of putting plywood between the boxspring and mattress? This is not our recommendation and really there are not to many advantages. Prolong mattress life by adding some temporary firmness to a mattress that is nearly worn out. It’s cheap and saves you money so you do not have to buy a new mattress set. Won’t have to deal with a mattress salesman. What is the disadvantage of putting plywood between the boxspring and mattress? Plywood under the mattress can cause the mattress to wear out quicker. Will not let mattress flex and give as it should. Using plywood may not allow the mattress to breathe properly and the wood can hold moisture even mold. Wood under the mattress can splinter causing the mattress fabric to snag and unravel especially in the case of 2 sided models. A mattress with plywood will not give the same support as a fresh new mattress. Probably not going to help a bad back. Does laying a piece of plywood between the mattress and boxspring void your warranty? Most of the time the answer is yes. You would need to read your warranty card for the specific warranty details. Most warranties are fairly straightforward in that when the mattress and boxsprings are being altered from their intended design say by placing a board between the boxspring and mattress your factory warranty will be void. NOTE: Just after the turn of the century the mass production of mattresses boxsprings came about. Virtually all boxsprings used coils springs that made them flexible. The coil-designed boxsprings would absorb up to 30 percent of the energy transferred through the mattress. We believed this to be crucial factor to increasing and extending the life of a mattress. Today with the ever-increasing popularity of thick layers of polyurethane foam, plush, and generously cushioned mattresses, many manufactures claim that the boxsprings are not as affective. By eliminating coil springs in a box spring mattress manufactures were able to decrease costs by decreasing the amount of steel. This is just one of many cost cutting solutions used to help minimize retail costs for the consumer. Another benefit of loosing coiled springs is motion transfer between sleeping partners has been virtually eliminated. None of these advances in the mattress and boxspring over the years has been due to slipping a piece of plywood between them. Our opinion is this: do not use a piece of plywood between your mattress and boxspring it has no real convincing and credible advantages. I recently ordered a new coil based (firm) mattress (Aireloom). I have a European (slightly bowed higher in the middle) slats platform bed. I have been advised that it’s fine to place a peace of plywood/masonite board on top of the slats and the mattress on top of that, instead of the matching foundation. I am more inclined to do that as the foundation will raise the height of the overall bed too much. However, based on your article above it concerns me that doing so may cause the mattress to wear out quicker. Or is that applicable only when placing the plywood in between a box spring and a mattress? ps. I cannot place the mattress directly on the slats as they are more than 2″ apart from each other. i ALSO NOTICE A LITTLE BIT OF DISCOMFORT SHOULD WE NOT USE THAT BOARD AND GET PLYWOOD ? You chose a smelly roofing board over plywood??? Many people have a reaction to plywood regardless of type. It is the Urea-formaldahyde that results in sore throats, red watery eyes, and burning in the sinuses. You might try a thick MDF. In any case, cover it with some type of heavy cloth material (a carpet?) I would rout all the edges on both sides just to make handling safer and less possibility of damaging the material. Asking questions of a salesman will generally result in the sale of some product and steer you away from any DIY solution no matter how good it may be. Wood isn’t very expensive and if it doesn’t work out you could always use the wood for a different project. Lol… What a load of crap! Really.. This guy is selling Mattress and BOX Spring, now why would he say that putting the plywood in soft or sagging mattress would help? He wants you to by the dam Box Spring and the Mattress Set With a Box Spring. All the Bed sellers makes more Profit with Box spring which has nothing in it and is very cheap but they charge you just as much as Mattress it self. This guy must be one of those mattress scam people. Terrible ! I have a sagging mattress , i want to find what is in firm mattress design makes it firm? I want to duplicate it. So far google search only show general mattress stuff not firm mattress. I think plywood solves problem. Who care the crap about old junk mattress. I think this article author is annoying (Explicative). And a LIAR. Alex, Good to see we can talk like men and more importantly, adults. It sounds like plywood solved your problem, this is great news for you, however not everyone will be so lucky, but I am happy genuinely happy that it worked out for you. So please help me out here, if I am understanding you correctly your only question is about what’s in a firm mattress and what about that design makes it firm? If this is indeed your question, well that is a completely different question that has nothing to do with the one that I am answering (the topic covered in this blog article). It is ashamed Google didn’t deliver the proper results you were looking for and perhaps taking it up with them may get you the answers you’re looking for or perhaps you could give me a call and we can discuss in detail what makes beds firmer and why I am a (EXPLICATIVE) AND A liar. As to whether plywood might work under a mattress is a trial and error thing that does not necessarily always have positive results. In fact it can actually be very costly for some mattress owners. Alex, I’m not really sure what the scam is you are inferring? This blog is NOT Selling anything. This blog article simply addresses the question: Plywood Between Mattress and Boxspring – Good or Bad Idea? 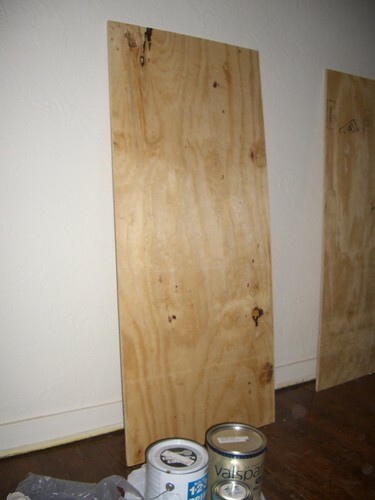 If you wanted to use plywood to help with firmness, does the plywood go on the metal frame or the box spring?…. please provide pros and con for each configuration. Chris, It would need to go between the mattress and the boxspring to maximize weight distribution. Putting on piece of plywood directly on top of the steel bed frame will lower the mattress approximately 9″ making it extremely low. Additionally there will be spongy spots in the plywood. Could be unsafe. Looking into a Sleep Number bed but don’t want to shell out for a new frame or support. The sale rep said to retain warranty it must be on a solid support and putting plywood between box springs and new Sleep Number bed would be warranty acceptable. But did warn that something between mattress and plywood would need to be added to protect underside of new mattress from damage (rubbing directly on plywood). So my question is: Is there any solid reliable platforms that can be used between box-springs and mattress? Douglas, Sir Question Neck Back Knee Pain What Type Mattress Should I Sleep In Soft Firm Or Something Just Hard? Can You Help Get Me In Right Direction. Please & Thank You. Royce.